Ah February, such a quirky little month. Only 28 days short, except when it’s 29. It kind of reminds me of Pluto, the Planet, except when it’s a celestial snowball or dwarf planet. February is such an anomaly. Health Club crowds are back to normal. All but the staunchest resolutioneers have reverted to sleeping in, their resolutions now a distant memory, waiting on the shelf until they take a go at it next year. February is a month where there is so much to celebrate and yet so few days to indulge in celebrating. What are you celebrating in the waning days of this shortest month? We are cramming as much as we can into the remainder of this little gem of a month. We’ve already enjoyed a Snow Moon, a Partial Eclipse, Valentine’s Day, and we are barely half done! February 18th, is DRINK WINE DAY, and, OPEN THAT BOTTLE NIGHT, both legitimate annual holidays for wine drinkers. Need an excuse for some weekday indulgence? Raise a glass for President’s Day, February 20th or upgrade from beads and beer on Mardi Gras, Fat Tuesday, February 28th. 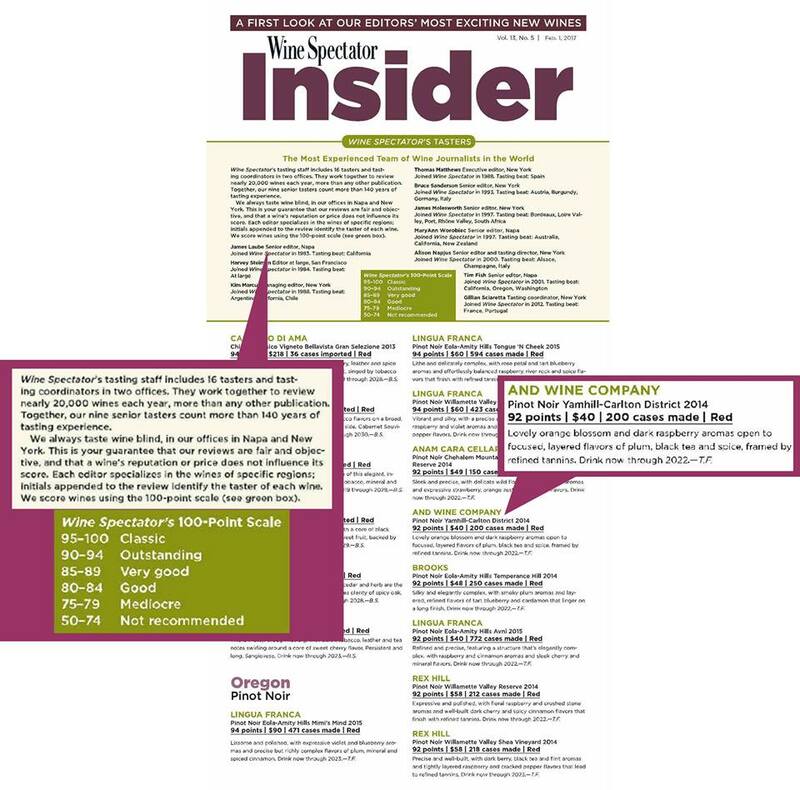 As for us, we are celebrating 3 great surprises: Recent blind tastings by Wine Spectator Magazine awarded our 2014 Pinot Noir a score of 92, followed closely by a 90 for our Estate Chardonnay, and an 88 on our Yamhill-Carlton Chardonnay! To help you celebrate during the remainder of February, all our wines are on sale for $40 per bottle (we pay shipping on orders of 6 or more). To purchase at this one-time only discounted friends and family rate, email your orders to info@andwinecompany.com. Sale ends 2/28. Recent accolades have already taken a toll on our inventory, so replenish your stock of …and…wines today! As a young company, we are very proud of these scores. We appreciate all of you who believed in us from the start! Please follow us on social media. Your “Likes”, “Shares”, and photos of you with friends and family enjoying …and… wines posted on your Facebook pages and our and wine Company’s Facebook page, are much appreciated! Be sure to tag us, and use our hashtag #andwinecompany too! We don’t make the most wine we can, we make the best wine we can. Terry Family Wines, And Wine Company and the Terry family announce special holiday pricing for the remainder of 2016, just in time for your gift giving and holiday celebrations. In addition to our normal offer of free shipping and 20% off of single bottle prices for 6 or more bottles, we are offering an additional 20% discount for the remainder of the year. Discount applies only for orders of 6 or more bottles.You must order by December 15th to ensure Christmas delivery but the holiday pricing is effective through 12/31/16. The special discount will be applied at checkout. Magnums not included. 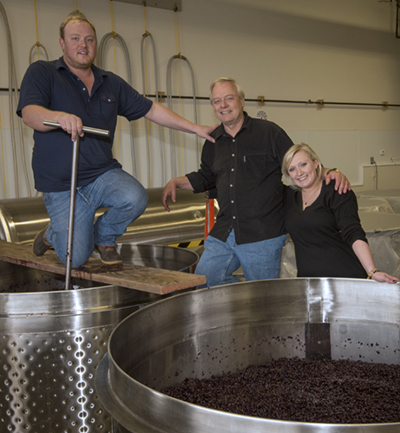 Greetings from all of us at Terry Family Wines! 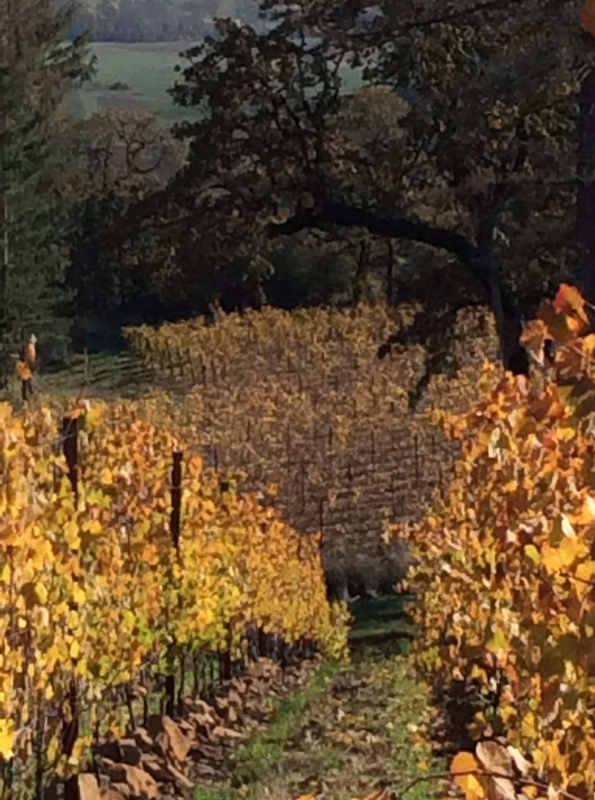 Now that Harvest is behind us, the Terry Family Vineyard is all buttoned up for a winter of repose. 2016 was our third harvest and it was bountiful and of exceptional quality. More about that later. But now our attentions are fully focused on readying ourselves for our favorite holiday, Thanksgiving. We will have a house full of family and friends from near and far and Leslie is busy planning lots of familiar traditional dishes alongside a few new offerings to try as well. You can be certain that we will enjoy our 2014 Estate Pinot Noir with the heartier fare and the 2014 Estate Chardonnay for the moments when a bright and lively refreshing white is called for. Please order your Thanksgiving wine this week to ensure delivery in time for your Holiday plans. TO ORDER JUST CLICK ON THE LINK OF OUR NEW WEBSITE WWW.ANDWINECOMPANY.COM. Our growing season started with a dry winter followed by a warm spring and the earliest bud break on record. There were a couple of 99 degree days in early summer followed by a relatively benign remainder before a couple more scorchers ended the season. 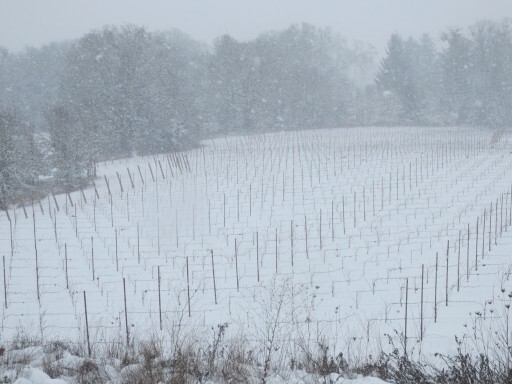 This see-saw of temperatures and complications at fruit set produced lots of hens and chicks in the vineyard, large seeded grapes (hens) and small seedless grapes (chicks) growing together on the same cluster. The French call this millerandage while the Australians call it peas and pumpkins. 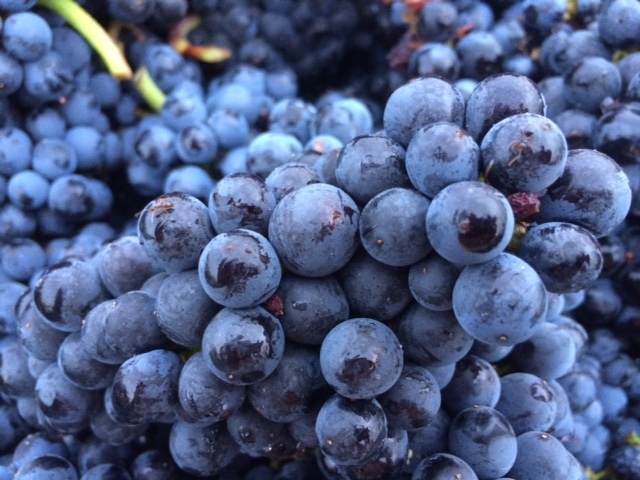 Whatever viticulturists call it, fully ripened smaller berries have a much higher ratio of skin to juice. Since the skin imparts color and tannins, these little grapes gave us wines of darker color and greater body and texture. So while we had a slightly lower yield than last year’s bumper crop, we produced beautiful color and ample body to support the ripe fruit flavors. I can’t wait to taste how it turns out when we bottle it next year. Many of our clever readers have noticed in my previous ramblings (which can be viewed by clicking view news archive) the occasional usage of …and… in my prose. Now we explain our not too subtle rationale of foreshadowing this important element of our wine. Please click on www.andwinecompany.com to read the entire story. …and… is more than a wine brand. It represents a lifestyle of inclusion. In the midst of a world that is too often marked by exclusion, we invite you to share a bottle of our wine with friends, old and new, and to harmonize, unite and gather to celebrate the simple things that join us all. We hope that you will enjoy our wines and that they will provide the backdrop for many happy adventures and exciting connections. Wishing everyone a peaceful season of giving thanks. Happy 2016 everyone! By now I’m sure many of you are deep into the process of reinventing yourself by way of the age old tradition of New Year’s resolutioneering. And perhaps, at least a few of us have already fallen from grace and reverted back into our well worn and quite comfortable roles as willful transgressors. My advice dear reader is to be careful with what you resolve. The law of unintended consequences is alive and well and I speak authoritatively of its effect. In my early 40’s I was well into a challenging career and New Year’s resolutioneering was a firmly ingrained habit of which I was quite proud. Backsliding from the enormous list of things I resolved to do each year to become a better ENTJ was also quite engrained, ensuring that my next year’s list would be even more daunting…and soul sucking. Patience please, loyal reader, this story will eventually get to the subject of wine…and perhaps even become interesting. After over a decade of under-performing on my lengthy resolution list each year, (read serious perfectionist tendencies) I happened across an article that suggested having only ONE resolution annually. This was a very novel and radical idea. I had so many things that needed improvement. How could I pick just one? By this time, I was half of a youngish married couple with small children, and we had developed an almost daily wine habit…also a nightly ice cream habit, which was adding to my waistline, creating yet another resolution that needed attention. But, as a newly minted convert to the minimalist school of Resolutions, I bravely selected only ONE New Year’s Resolution. I still have all of my annual resolutions for the past 25+ years and this is what our resolution was for that year. “We will drink less, but better wine. By increasing the quality of the wine we drink, we will increase our enjoyment, and therefore, reduce our overall spending.” Both of us signed on earnestly. As the new year unfolded, all went as planned until maybe February…Yes we were buying better wine (read 750 ml vs. jug). Yes, we were enjoying the wine much more, noticing nuances and varietal characteristics that just didn’t exist in the jugged plonk we had become accustomed to. But we noticed something else almost immediately–we began learning about wines and regions and how to pair it with foods, and we enjoyed talking about wines and sharing wines with friends. We began splurging for special occasions, and even vacationing in wine country venues. Wine had quickly become much more than a joyless habit, remarkable only for its flabby sameness. And NO, we did not reduce our overall wine spending. Harvesting is all done by hand. No mechanical harvesting done on our farm. As the years rolled by, resolutions came and went. I became more scientific about my spending patterns. By this time I had improved my wine knowledge and enjoyment, and had even allowed myself the aspiration of owning my own wine business. In preparation for that distant reality, I paid off all my debt and continued to track my spending, still resolving to drink less but better wine (no comment on nightly ice cream). Under the steely eye of my expense tracking software, the truth was inescapable—I was learning a lot about viticulture and enology (farming and wine-making) and spending a LOT of money on wine! As I consulted with my financial advisor (and my own inner critic) I was always a bit uncomfortable speaking the indelicate truth of the extent of my annual wine spend until my CPA quipped, “Don’t be so hard on yourself. You have no debt and you have a good income. The amount you are spending is not any different than a modest mortgage or car note. Why don’t you just call it your ‘wine note’?” Savvy advisor or enabler? Either way he’s still my financial guy today. All successful vineyards have one thing in common; the owners footsteps. Fast forward a few more years, and many more New Year’s Resolutions, and here I am on January 3, 2016, preparing yet another list of to do’s. This dear friends, is where we get back on task and start to talk about wine. Thank you for persevering with my trip down memory lane. I am sure there is a point to be made somewhere in our very near future. Oh, yes, be careful with this dangerous habit of New Year’s Resolutions. They can lead you to unintended places, and have strange, unintended outcomes. As for me, I consider myself somewhat of a radical “resolutioneer”. My resolutions this year are: 1. 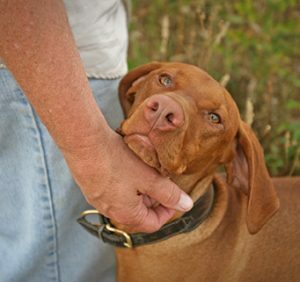 Be kind to all living beings; 2. Gratitude is the central tenant of life; 3. Never, ever compromise on quality; 4. Be authentic, and 5. No regrets. Finally, I’ve checked off the resolution to drink less but better wine. Now, about our wines. 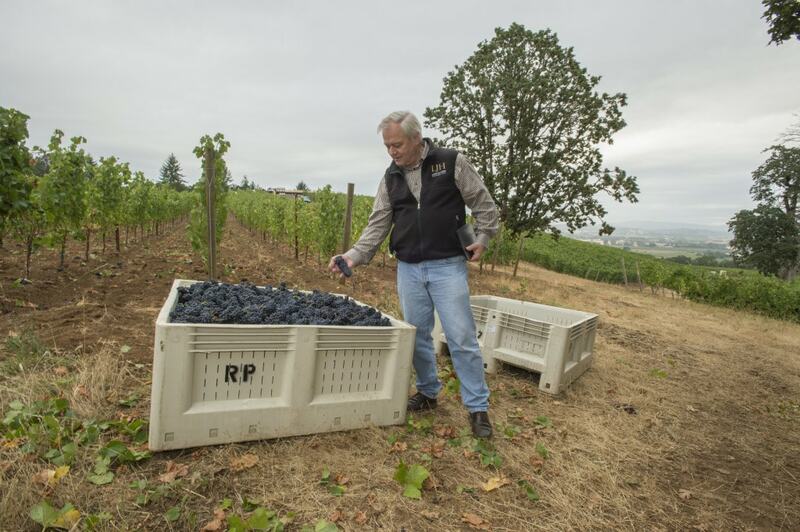 The year 2015 was a perfect year for growing grapes in Oregon’s Willamette Valley. Our harvest was plentiful and very high quality. Noted experts claim it was the best crop in the last 35 years. Time and barrel aging will tell. Our 2014 lineup was released in October. All of our 2014 releases are sourced from our estate vineyard. We did not purchase any fruit, preferring to control every aspect of the wine making by using our own carefully tended fruit exclusively. We now have two Chardonnay offerings, one is a Burgundian style and the other is more of a new world style. Both are outstanding! Only 48 cases made. We also released two 2014 Pinot Noirs which are 100% estate sourced. Tasting notes and critical reviews are forthcoming in the not too distant future. We are very pleased with all of our new offerings …and…Yes, our family is drinking higher quality wines than ever…and… No, we are not eating less ice cream. The art of the hand pick. Resolve to drink better wine, but be careful, you might find yourself owning a wine business, a major unintended consequence. We still have a few cases of our inaugural 2013 Pinot Noir left. Our 2014 vintage of Estate Pinot Noir and Estate Chardonnay are recently released and ready for your enjoyment. Call me at 503-839-6343 for pricing and availability. Please share this blog with anyone who might be interested, and follow us on social media with the links below. We are a new brand, relatively unknown in the industry, and available only through direct sales at this time therefore, word of mouth referrals are very much appreciated. Most of all, we invite you to make our wines a part of your new year by resolving to drink better wine. Wine that is authentic and of uncompromising quality. Wine that is scarce and can’t be purchased anywhere but directly from me. Wine that truly connects you with our land and our story and our common connections. After all, we are all joined at the sip! From our family to yours, we wish you all the best in 2016! 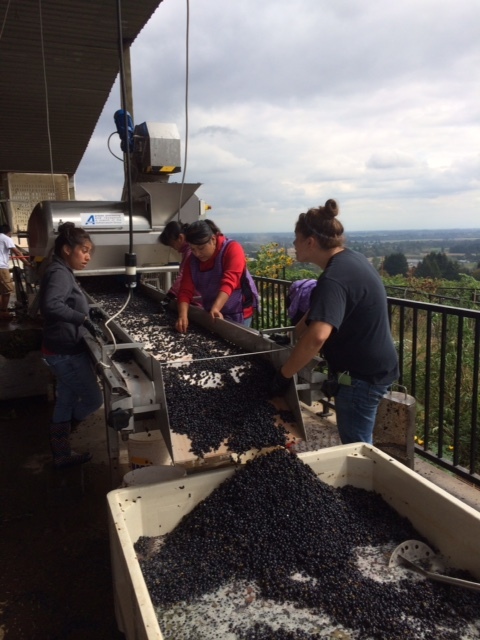 Pictures from our 2015 harvest. 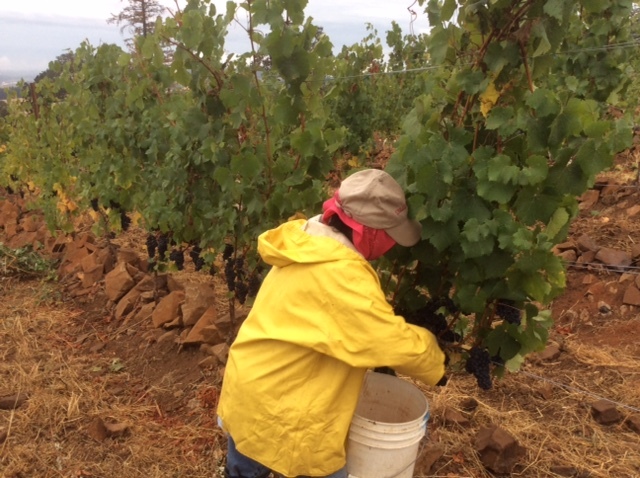 The beginning of harvest 2015. 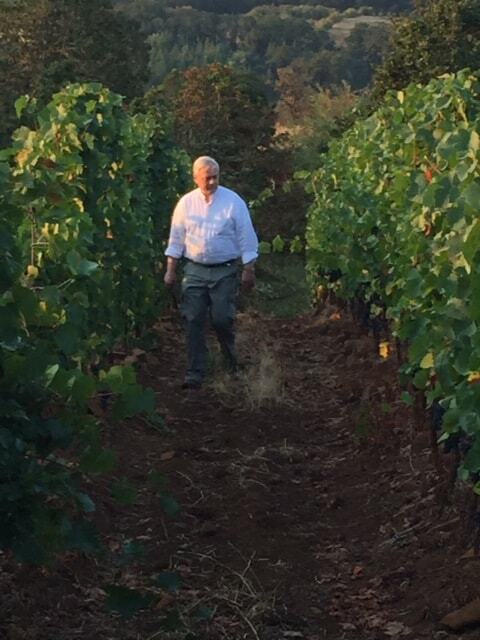 Rick inspecting the Pinot harvest. Four sets of eyes makes sure every single grape is worthy. Summer of 2014 was a season of firsts for our family, although in wine parlance it is known as third leaf, a term used to describe the third year after a vineyard has been planted. First though, some history. We planted in the fall of 2011. Fall planting is atypical. Most vineyards are planted in the spring. Ours was a risky decision because a newly grafted young vine can be more easily damaged by freezing weather than a more mature vine. Nevertheless, we planted the newly spliced vines, still verdant and leafy, in November 2011, gambling that the forecast of a mild winter would be accurate. In just a few short months, we knew that our steep, rocky slopes, coupled with the likelihood of cruel summer heat and possible drought, would be a hostile environment for young vines. So we gambled that a few extra months of “settling in” would allow for a healthy commercial crop by third leaf. In a matter of days after planting the 24,000 small leafy vines, a cold front blew through like the Mistral and I found myself the proud owner of a field of lowly sticks -Not a speck of green to be found on any of my new vines. “No worries” said my ever optimistic vineyard manager, Evan Bellingar. “Leaf drop always occurs but usually not this fast.” I tried to be optimistic but I admit that the uninspiring field of sticks that I had just paid $35k for made for a winter that tested my faith just a bit. First leaf occurred in 2012 and it was not an inspiring sight, but we staged a minor celebration anyway. At least the stickyard had come back to life and green shoots were celebrated as if they were a dove returning with an olive branch after Noah’s flood. Weeds and rocks towered over the spindly vines and more than a few times I fretted about how forlorn my weed infested “vineyard” looked. Second leaf occurred on schedule in 2013. Rocks and weeds again predominated but the sucker rods (24 inch high supports resembling welding rods stuck in the ground and tethered to each young vine to provide support) provided some row definition to where, one with a healthy imagination, could convince oneself that this rock patch might one day become a vineyard. Late that fall of 2013, stakes, end posts, and trellis wire were installed, towering over the weedy mélange, but at least providing some defined rows, columns and symmetry. By spring of 2014 the grape vines were “growing like weeds” and finally were taller than the trellis wire, weeds, rocks, and cover crop. By June 21, when Leslie and I got married, a vineyard had miraculously manifested itself with beautiful vines of 40” height while the weeds had been mowed for the big day and the rocks obediently faded into the vineyard floor. What a beautiful day it was! We harvested our Chardonnay on September 11 and I was amazed at the growth that had occurred just since our wedding a mere three months earlier. Finally, I had a real vineyard, with tons of luscious pale green chardonnay clusters gleaming in the sun. 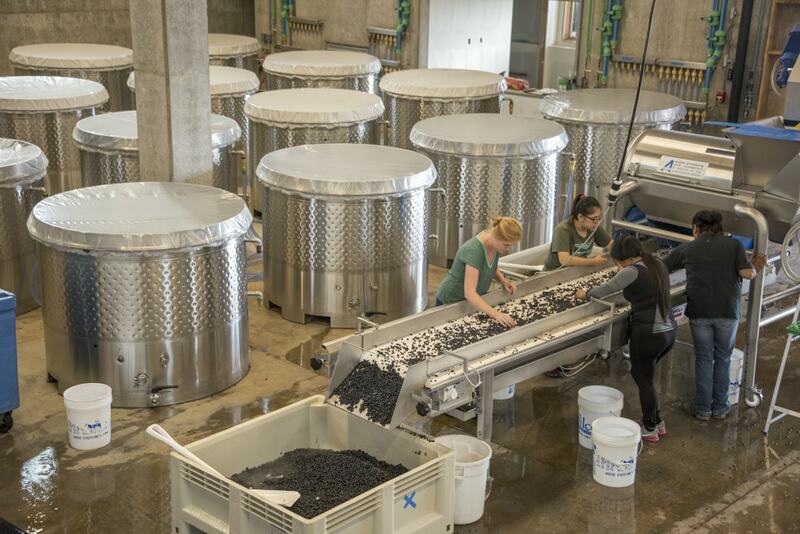 We harvested our three tons of Chardonnay grapes, at 23 brix, a measurement of sugar content, starting at 6 AM. We were done picking by 11 AM and at the winery by noon. Not bad! Although the Chardonnay was picked at optimal brix and ripeness, Jared Etzel, our wine maker, wanted to maximize the hang time for our Pinot Noir thereby allowing, not only the fruit to reach optimal ripeness but also, the seeds and stems to fully ripen. He estimated another ten days before we should harvest the Pinot Noir. 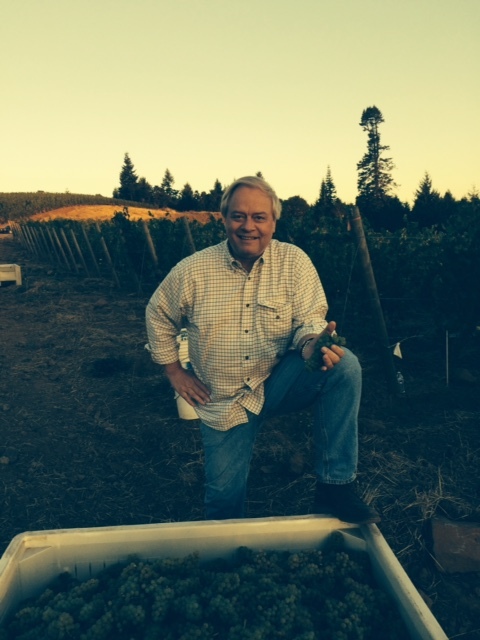 I flew back to Houston elated with the early Chardonnay harvest and ready for a few days rest before returning to Oregon for the Pinot Noir pick. At the time we were experiencing very hot temperatures and no rain so, a mere four days after returning to Houston, Jared called excitedly announcing that the Pinot Noir was perfect and we would harvest the following day, assuming Results Partners could procure the picking crew. Back to Oregon I jetted, having not even unpacked my bag from the Chardonnay harvest which had been very exciting for this rookie vineyard owner. But it was a relatively small deal since we only have two acres of Chardonnay planted. The morning of harvest for the Pinot Noir was another endeavor entirely. By 6:30 am I arrived at the vineyard facing cool and foggy conditions with rain threatening at any moment. It looked as if my vineyard had been repurposed as a used car lot. Small 10-15 year old pickups, SUV’s and compact cars were strewn up the hill, parked to the side of the newly completed 3,000 foot driveway, all the way from the county road to the top of the hill. Over 30 pickers, dressed in hoodies, CPO jackets and all manner of cold weather gear, were already there receiving last minute picking instructions about which blocks to harvest and how many tons were needed from each block. 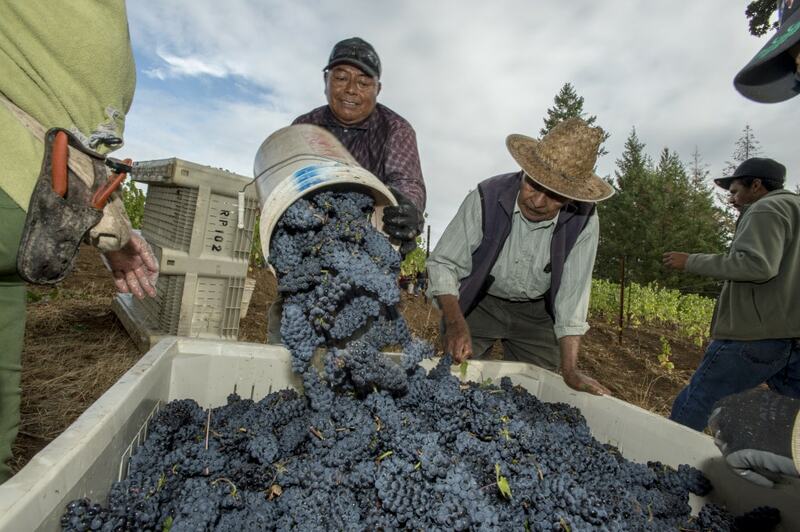 The pickers worked quickly, their strong hands expertly snipping the ripe fruit clusters from the vines, filling their 2 gallon plastic buckets and then running up the row to deposit their purple-hued treasure into the bins. Tractors, port-a-potties, mini-bins, the pick team, flatbed trailers and supervisors, all fulfilled their individual roles expertly in the early morning mist and fog. Indeed, I was witnessing a big operation. I watched in awe as the earnest migrant community toiled expertly to bring in the pristine cool fruit for us. 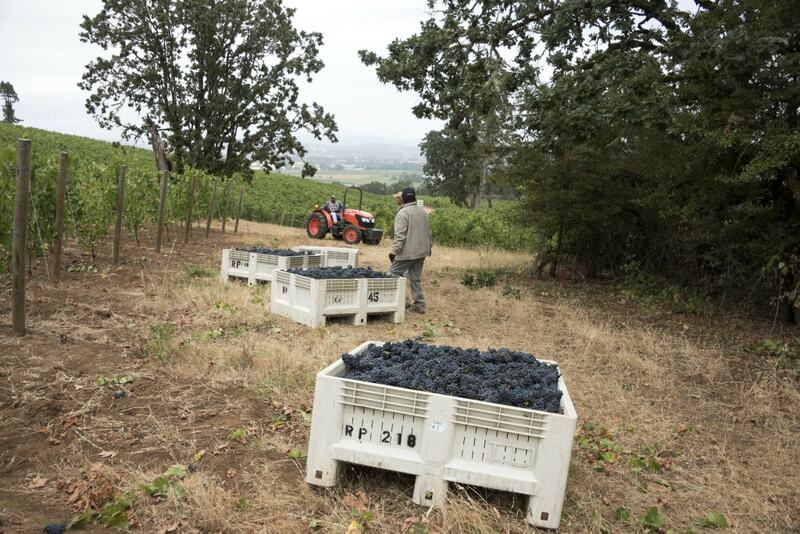 We harvested 7.3 tons for our own estate Pinot Noir wine. The remaining 14 tons were sold to other wineries. We finished our pick by 1:00 PM and loaded 28 bins on the flatbed trailers and drove them to the winery. Before the hard working tribe could hurry to their next pick, I shook the strong calloused hand of every crew member and thanked them for their part in making our family dream come true. I am sure they wondered what this moist-eyed gringo was babbling about but they indulged me, shyly mouthed de nada and hurried on to their next job. Still feeling emotional, I decided to tour the vineyard and pull myself back together. As I walked the rows of vines that had just surrendered their treasure to the expert hands of the pick crew, I felt at one with nature, and this day and time in the cosmos. Peaceful. Maybe it was my imagination but the young vines looked spent. I continued my walking meditation thanking them for their yeoman’s service; I thanked them for carrying such a heavy load on their young spindly shoulders. I thanked them for a job faithfully and well done and wished them a well-deserved slumber. An emotional day indeed…and not even half done yet! The day was still blustery and overcast, even in the early afternoon, and the fruit was night- time cool and in perfect condition as we gently placed it onto the sorting line which was (wo)manned by eight females of various ages. Not a single grape escaped the piercing gaze of multiple sets of brown eyes searching for any slight imperfection, rot, mildew, sticks, leaves or insects which were discarded before reaching the destemmer. This is an expensive and back breaking way to sort fruit. But we think only perfect fruit should be in your wine and our meticulous attention to the tiniest of details will show up in your glass in the most satisfying way. Sorting and crushing the fruit took all day. 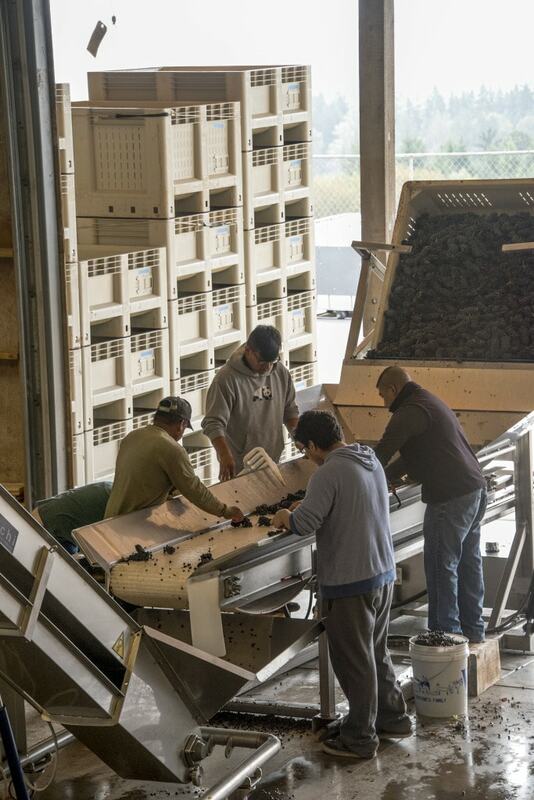 After the sorting crew’s hand inspection, the grapes rode the conveyor belt into the destemmer and then down into a huge holding tank. Dry ice was added to the tank for a “cold soak” which extracts maximum color and richness from the fruit. Finally the fruit was pumped into new stainless steel fermentation tanks where they would bubble away happily as the natural yeasts catalyzed the fruit sugars into alcohol over the next few weeks. Later the young wine was pumped into our new French Oak barrels procured from Francois Freres where the magic osmosis of oak and fruit, sugar and alcohol are transformed into the nectar we all so enjoy uncorking on the occasions – big and small – that make up the pleasing texture of lives shared and well lived. It’s common to harvest the current year’s crop and then bottle the prior year’s wine the very next day if it is ready. This allows about a month to get the barrels sterilized and ready to hold the current year’s new wine as it comes out of the fermentation tanks a few days or weeks later. The next day at an ungodly predawn hour the portable bottling line arrived to bottle our 2013 starter vintage. This is a semi-trailer equipped with a million dollars of automated bottling equipment inside. It is capable of bottling, corking, labeling, and boxing several hundred bottles per hour. The bottling crew consisted of six liberally tatted and pierced millennials, each responsible for a finite section of the bottling line e.g. intake, labeling, corking, boxing, and storage. Their work requires precision and attention to minute details (are you noticing a pattern here?). If a glitch occurs in the bottling line and goes undetected, it can cause debilitating quality problems, ruined wine and expensive “do overs” of the bottling, labeling, corking, and storage process. Because we had decided to use extra-long ultra-premium corks, we had an early problem in the process where the corks, when inserted by the machine, were not flush with the top of the bottle. Instead the corks protruded a mere 1/32nd” above the top of the bottle which made the tin capsule that encases the cork at the top of the bottle fit incorrectly. The crew quickly spotted the problem, made the needed adjustments and finished with a flawless bottling day. After bottling and casing the wine, the cases were forklifted back into the winery and loaded onto palettes, 49 cases to the palette. Within days our initial 2013 vintage of 200 cases was shipped to The Trappist Abbey nearby for climate controlled, perfect storage conditions to wait as shiners until our wine labels were approved by the TTB. Our labels were designed by our family with assistance from Pail, a graphic design firm in Portland. We debated, rebated cussed, discussed every small detail of the label and color palette. In short, we were obsessive about every aspect of the design aesthetic. Every label must be approved by the TTB and our label was presented for approval in late January 2015. Once we received TTB approval, we had the labels and capsules printed and then applied to our “shiners” waiting patiently at the Trappist Abbey. Once the wine is labeled, it will be ready to ship to our buyers at last. I’m sure that we could have had our inaugural vintage into your hands in December 2014, were it not for my rookie mistakes and underestimation of the length of time required for regulatory approval. Not to worry though, the extra few months of bottle aging is allowing the wine to age in perfect conditions. When you receive your case(s) I’m sure that you will be glad you waited for it. This post, coupled with the Thanksgiving 2014 post essentially summarizes the major events from the time I bought the rock pile…er field of sticks…um…weed patch …ahem… vineyard… up to the present. 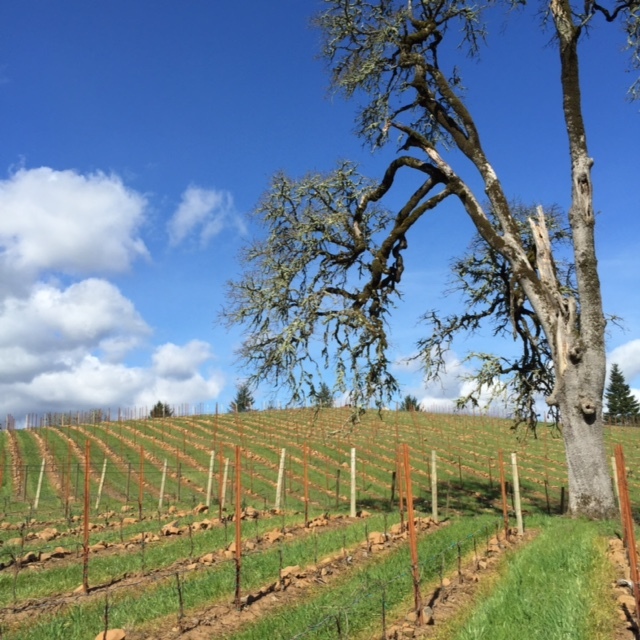 Future posts will be more frequent and timely (and shorter) as to goings-on in the vineyard and the winery so that you can enjoy the natural seasonal rhythms that drive our business. We hope our stories will be informative and maybe even entertaining … and … we hope our wine and the story of how we make it will connect you and your family with the rock and humus; the seasons and soul; the vision, the memories and the dreams of our land and our family. Thank you for reading our blog and for sharing our journey. 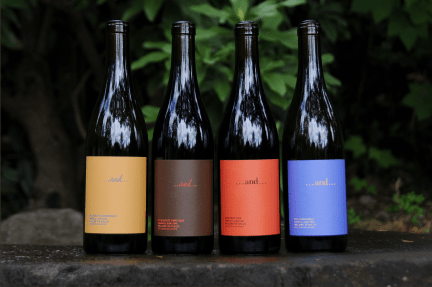 Post script: June 21, 2015 – On this momentous date, the summer equinox, Fathers Day and Leslie and my first anniversary, I am happy to announce that our wine is, at long last, available for purchase. We sell only direct to consumer which means that you cannot find our wine in any store or restaurant. It can only be purchased by ordering on our website or calling me direct. I look forward to sharing our wine with you and your family. Order your 2013 Pinot Noir wine now. Please share this with your friends and fellow wine lovers. We are a new brand; unknown in the industry, and available only through direct sales at this time. Word of mouth referrals are so very appreciated. As I write in the quiet morning sun on Thanksgiving eve my heart overflows with feelings of gratitude and good will. The Thanksgiving season has always been my favorite holiday for so many reasons – warm days and crisp nights; a sense of bounty from the recent harvest; the birthdays of my son Ad and the four legged member of our family, Trixie; the annual release of the Beaujolais Nouveau; crackling fires and family and friends with whom to enjoy it; and a lifetime collection of friends with whom to share past memories and new beginnings. Many of you know that in 2012 I exchanged the rigors of my professional career in banking and wealth management for the challenges offered by a more entrepreneurial route. I now spend most days in my boutique consulting/executive coaching business helping executives, entrepreneurs, and successful families achieve their goals. In the meanwhile, since 2010 I have been nurturing our family vineyard and wine business and that is what I want to update you on today. This summer I married my longtime friend, love, partner, and confidante, Leslie Searle. 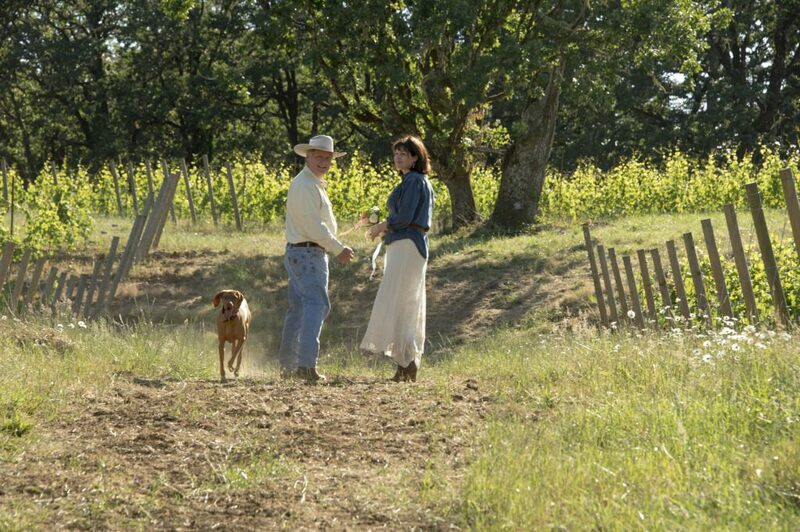 We were married on a cloudless, warm sunny day on the Terry vineyard near Yamhill, Oregon surrounded by that which we treasure most – our children, close friends, Trixie, the ring bearer and new equine friends. The ceremony took place under an ancient, stately oak tree surrounded by beautiful Pinot Noir vines from our most prized block. Be on the lookout for our Wedding Tree Pinot Noir. It represents the connection of all that we hold dearest. Rick and Leslie on their wedding day with Trixie the ring bearer. 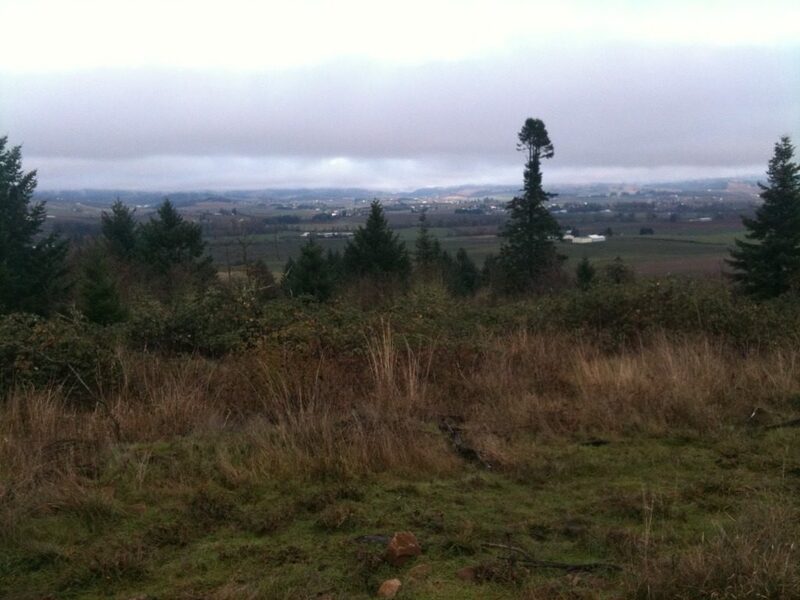 In January 2010, I found a gnarled, rocky, overgrown and abandoned Christmas tree farm near Yamhill, Oregon nestled in the foothills of the Coastal Range. It rose steeply from a gravel county road at 215 feet up to 520 feet high with a commanding view of Mount Hood to the east and nothing but forested mountains all the way to the Pacific Ocean 50 miles to the west. It was the first property that a realtor showed me and we discounted it as too much work and proceeded to look at over forty other properties. On a balmy Thanksgiving night in 2010, poolside, enjoying a bottle of Beaux Freres Pinot Noir, I decided to make an offer on the bedraggled Christmas tree farm. A thorough but quick due diligence period followed and in a matter of a few weeks I was the proud owner of a jumbled pile of rocks, wild blackberry vines and lots of poison oak. 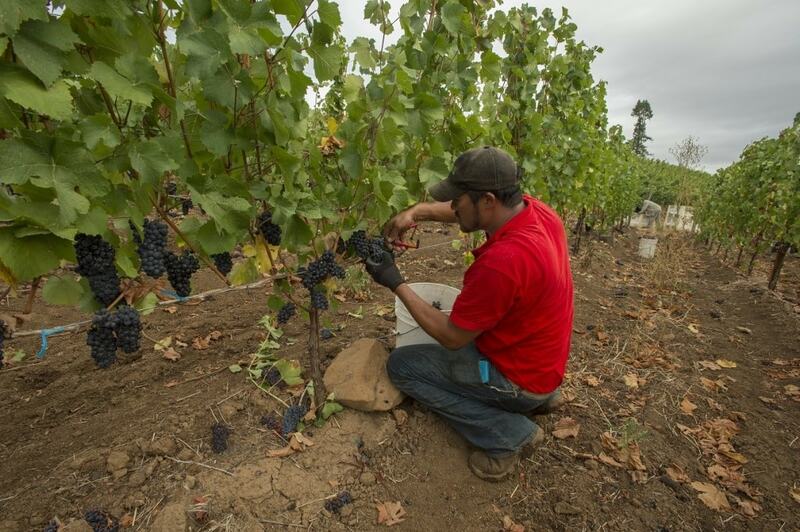 We hired the best vineyard management company in the Willamette Valley, Results Partners. Our vineyard manager is a youthful 30-something named Evan Bellingar. He and his team manage all development and farming activities. Development started immediately which meant the deconstruction and clearing of decades of brush and vines and 40 foot high Christmas trees gone wild. Then came the ripping of the sparse topsoil to make room for root growth of new, soon-to-be-planted, grape vines. A ripper literally claws the earth to a depth of four feet or more. It’s hot, dirty work and requires enormous amounts of diesel to fuel the large earth moving equipment for several months. The ripping unearthed the biggest surprise of our entrepreneurial venture so far. Massive boulders seemed to magically (or tragically, some may say) rise to the surface like bubbles in boiling water. Some were the size of Volkswagens. Needless to say, we had enormous cost overruns on our “excavation” line item in the budget. Once the clearing was completed, we were amazed at the staggering beauty of the steep and undulating slopes that had been hidden under decades of overgrown brush and tree growth. Enough boulders and stones have been “harvested” to build a future winery and rock fence lining the 3,000 foot driveway. In November 2011, we planted over 25,000 grape vines, including 15 different clones of Pinot Noir and Chardonnay with varying root stocks based on individual plots’ soil characteristics. For the next two years, I waited impatiently for a vineyard to appear. I joked with Evan that it looks more like I’m growing rocks and weeds than a vineyard. The young vines grew slowly and the weeds from the newly liberated seed bank grew, well, like weeds – fast! Unbelievably, the rocks continued to percolate to the surface – by the thousands. Our vineyard became famous, or infamous perhaps, for its profusion of rocks – unlike any other vineyard in the region. Farmers clucked sympathetically at how much it must have cost to “clear” this rock garden and how many bent farm implements are in my future. Local wine makers began to call me, unsolicited, wanting to buy our fruit. Rocks are the bane to farmers but an aphrodisiac to winemakers due to the aromatics and minerality that they impart to the flavor profile of the fruit and hence the wine. In 2012, I met Jared Etzel, son of Mike Etzel of Beaux Freres, and nephew of Robert Parker, the wine critic. Jared has rock star wine DNA, having worked on his family’s vineyard since pre-school days, obtaining degrees in enology and viticulture and then making wine in Napa before returning to Oregon. Jared became my winemaker and our team was completed. 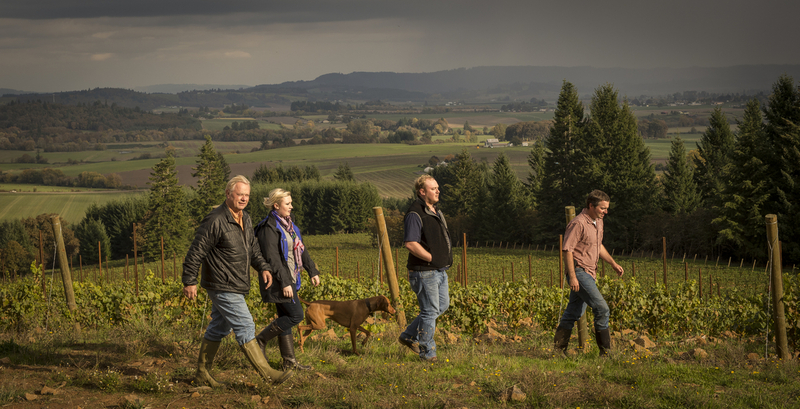 Ad and Colleen Terry and Jared Etzel and Evan Bellingar are all within 2-3 years of being the same age and represent the youthful future of our wine business. In 2013 we made 200 cases of Pinot Noir. The wine is patiently bottle-aging and ready to be purchased once our label is approved. I hope to have it available for you to buy and share with your clients, family and friends by Christmas or New Year’s Day. Our next communication will be sent to you in a couple of weeks. It will be shorter than this one. We will discuss the record-breaking 2014 harvest, our estate Pinot Noir and Chardonnay that is ready to go into our new French Oak barrels to be released for your enjoyment before next Thanksgiving. Thank you for your friendship and for taking the time to read our story. We wish you a happy, healthy, and safe Thanksgiving season. Our grapes are Trixie approved! Pre-order NOW!